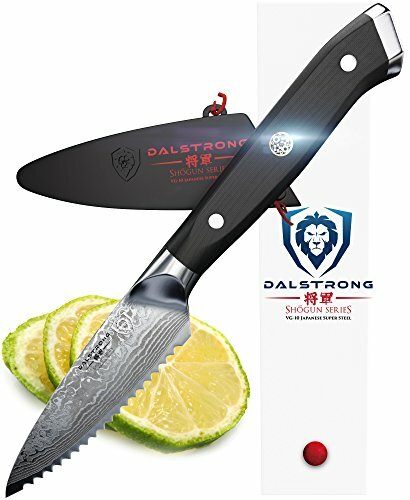 • The Dalstrong Shogun Series serrated paring knife is painstakingly crafted over 60 days using the highest quality materials, it is both a razor-sharp kitchen powerhouse and artistic statement in premium design and workmanship. Combining ancient Japanese sword making methods with the latest in breakthrough technologies, the Shogun Series is simply unrivaled in performance, beauty and value. The Dalstrong Shogun Series paring knife is a brilliant statement in premium performance, superb craftsmanship, and spectacular artistry. Now you are slicing with power. DALSTRONG POWER! A Dalstrong culinary revolution combining outstanding and award-winning craftsmanship, cutting-edge breakthrough technology, awe-inspiring design, and the absolute best materials available. Ideal for tough-skinned fruit (such as tomatoes, oranges, lemons, limes, kiwis, avocados and more) and vegetables with soft interiors, small crusty loaves, pastries, and dried or tough meats. The blade is also suited for detailed cutting and scoring patterns and designs on surfaces of food. Dalstrong Power: An ultra sharp VG-10 Japanese super steel cutting core at 62+ Rockwell hardness: extraordinary performance and edge retention. 66 layers of premium high-carbon stainless steel layers ensure exceptional strength, durability and stain resistance. Perfectly balanced, the precisely tapered blade minimizes surface resistance for buttery smooth cut through and enhanced non-stick properties. Remarkably patterned with Dalstrong's stunning 'tsunami-rose' Damascus layers. Dalstrong Trust: Rocksolid 100% SATISFACTION OR MONEY BACK GUARANTEE, try it risk free. LIFETIME WARRANTY against defect. Renowned Dalstrong customer service. See why chef's around the world trust and love, 'The Dalstrong Difference'. Dalstrong luxury packaging. Now you are slicing with POWER. Dalstrong POWER! Color: Black G10 Handle, Nitrogen Cooled Vg10 Damascus 66-layers, Honbazuke Sharpening, Full Tang, Premium Packaging, Lifetime Warranty, Dalstrong Support.